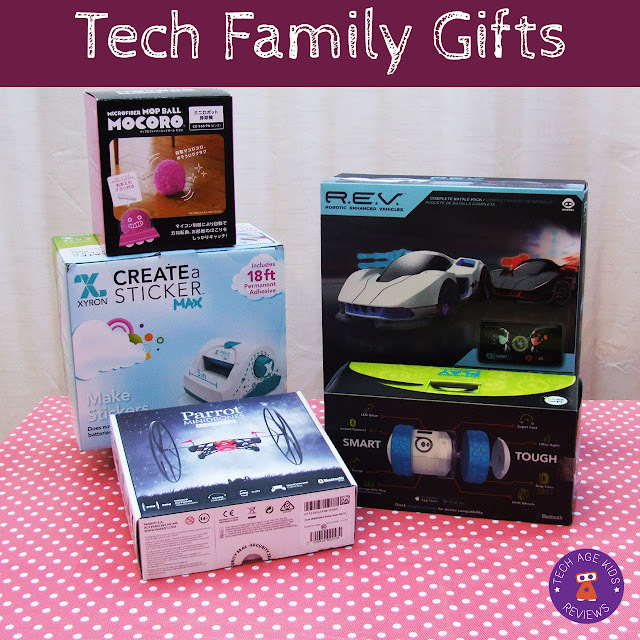 Inspired by Elbrie's Construction Christmas gifts post, here's our top 5 family tech gifts from this year. We've had lots of fun with tech toys and gadgets over the last week. Our selections aren't in order - they will appeal to different members of the family. I wish I'd paid more attention to the post I wrote on preparing for a pain free tech Christmas - we still didn't have enough batteries! Thank goodness the Parrot rolling spider and Sphero Ollie are rechargeable. WowWee R.E.V Cars - These were an impulse buy as they were on offer and turned out to be a big hit with my 9 year old (and me!) The cars are controlled from a tablet or phone. You can either play in two player battle mode or have one of the cars AI controlled and battle against increasingly difficult enemies. The AI mode was surprisingly engaging and my 9 year old spent a lot of time with this on Christmas day. I also really enjoyed it - the physical cars made the gameplay really exciting. We'd love to see a feature where kids can program their own AIs and battle them. My 9 year old wanted a mini quadcopter. These are not usually recommended for children under 14 but the Parrot Minidrone Rolling Spider is supported by the Tickle and Tynker kids coding apps which suggest it's okay for supervised use with younger children. This is a fun activity for my son to share with his Dad so after much research we went ahead. The verdict is: very cool! They have also 3D printed some propeller protectors for extra protection. My 7 year old is completely taken with his Sphero Ollie. He specifically requested this and loves its cool factor. He's keen to show off the tricks that Ollie can do and wants to get a ramp accessory. We like that Ollie can also be programmed with Tickle and Tynker so as well as being a neat toy he'll be able to program it too. My 7 year old also asked for a sticker making machine. Once I realized these existing I wanted one too! We got a proper Xyron Create a Sticker Max craft machine that we can use together rather than a toy. We had fun turning Christmas gift wrapping paper into stickers and decorating a notebook. I can see that this gadget will come out regularly in our making. And unlike everything else on this list it doesn't need batteries or charging. I got a Mocoro Mop Ball which is a daft and slightly useful household robot. It rolls around picking up dust in its microfibre jacket and makes cute noises. It's not the best cleaning device ever but it does pick up dust and is definitely entertaining and surprisingly cute. And it's not difficult to persuade the boys use it. We'll be reviewing these toys and gadgets in more detail in future posts and covering lots more cool kids and family tech this year so don't forget to sign up to our weekly mailing list.